The Sandy Creek Central School District’s “Wall of Excellence” recently gained two new members as Sue Ann Archibee and Sue Bitz were both inducted into the program. 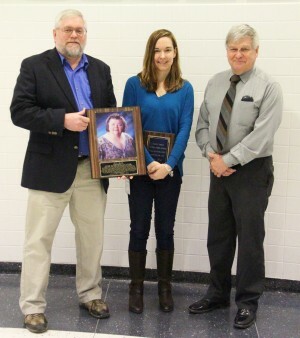 From left, Sandy Creek Board of Education president Brian MacVean, guidance counselor Tanya VanOrnum and board vice president John Shelmidine honor Sue Bitz during the 2015 “Wall of Excellence” induction ceremony. The “Wall of Excellence” program recognizes both past and present faculty and staff members who have exhibited unforgettable commitment and service to the children of the Sandy Creek Central School District. “I thank you for the honor of being included with Sue Bitz, and all the other staff members who are recognized on this wall,” said Archibee. Archibee, who started working at Sandy Creek Central School District in 1982, said she spent the first couple years of her tenure feeling inadequate in comparison to more experienced staff members. But after watching and learning from others, Archibee soon realized she had become entrenched in the Sandy Creek family. 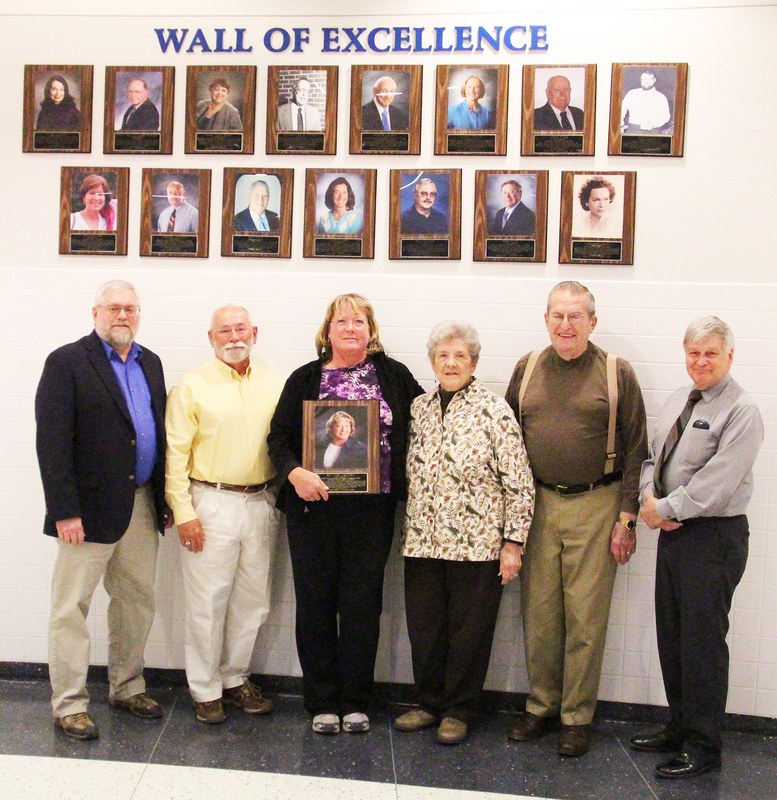 From left, Sandy Creek Board of Education president Brian MacVean, Ron Archibee, Sue Ann Archibee, parents Betty and Carl Bauder and board vice president John Shelmidine pose under the “Wall of Excellence.” Archibee was recently inducted into the prestigious program. Bitz was known for her dedication to the district and community. She not only taught English, but also kindness, self-respect and humility. Bitz, who passed away in 2013, also served on several committees to help improve student achievement. She helped raise countless money for the Dollars for Scholars program and ran her famous chicken barbeques for multiple fundraisers. Archibee said during her speech that she was honored to be placed on the “Wall of Excellence” in the same year as Bitz. “I know she considered it a great life accomplishment to teach here, and she showed that in all she did for our kids,” said Archibee.